What is Natural Chemistry De Flea Pet & Bedding Spray? Natural Chemistry De Flea Pet & Bedding Spray is an all-in-one flea-killing spray formula. Not only is it safe enough to use on your pet, but it's also safe enough to spray on bedding, or any other place your pet may have come in contact. The good news is, De Flea Pet & Bedding Spray is made with biodegradable ingredients, so you don't have to worry about harsh chemicals or the effect on the environment. In addition, it is easy to use, kills on contact, and can be used on dogs and puppies (12 weeks and older). For more flea-killing power, also try Natural Chemistry DeFlea Shampoo for Dogs & Puppies. The active ingredients in Natural Chemistry DeFlea Pet & Bedding Spray are not only safe for the environment, but they are also effective. With the use of biodegradable ingredients, DeFlea Pet & Bedding Spray can be used directly on your pet and on your pet's bedding. 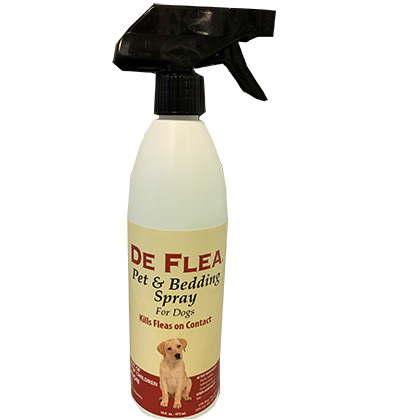 DeFlea Pet & Bedding Spray kills on contact, and can be used on dogs and puppies 12 weeks of age and older. Keep out of reach of children. Do not use on pets under 12 weeks. Consult a veterinarian before using this product on debilitated, aged, medicated, pregnant, or nursing pets. Sensitivities may occur after using any pesticide product for pets. If any signs of sensitivity occur, bathe your pet with mild soap and rinse with large amounts of water. If signs continue, consult a veterinarian immediately. Store below 120°F. Do not allow product to freeze.